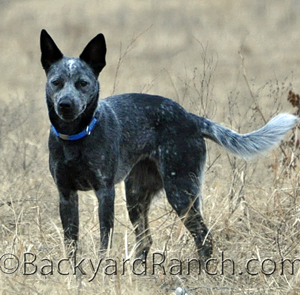 The cattle dog can be a smart addition to your backyard ranch. Besides a companion, they can assist in the tasks at hand. Adding a good cattle dog can be like adding two good hired hands when moving stock. With their herding instinct and some training, they can help move stock and even move it by themselves. Herding dogs are high drive, smart, loyal, determined and part of the family. There are many herding breeds to choose from for a cattle dog, depending on your needs for livestock herding and/or livestock protection. The AKC has a great website that gives a full description on every breed recognized in the herding class. 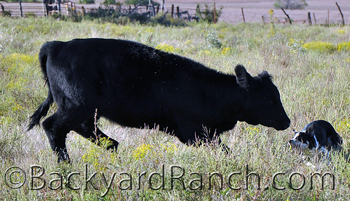 A few breeds of the herding class are great for livestock protection, for example the Great Pyranese. The most common breeds in the mid-west for herding cattle dogs are: the Border Collie, the Australian Cattle Dog or “heeler” and the Australian Shepherd. The herding class breeds of cattle dogs are very smart with high drive and will go into business for themselves if left unattended. Cattle dogs of this caliber require smart daily play when they do not have a job to do. Cattle dogs are handy for small pests as well such as rabbits, rats, opossums, mice and unfortunately skunks (see our tips page for the skunk bath formula). They quickly become a member of the family, seen on couches and in feed trucks across the country. 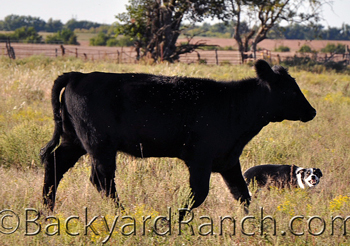 When shopping for a cattle dog for your ranch, you need to take in consideration the job you need help with, what type of livestock you own, the weather conditions and terrain, what family needs you have, how much devoted time you will have. Whether it is sheep, cows, goats or horses, a cattle dog can be more than just a helping hand. See our cattle dog collar page and our healthy pet food page for more on cattle dogs.